The biggest and difficult challenge in hemodialysis access is to maintain it over the time in the expanding number of patients with end-stage renal failure (1). There is little consensus discussed about the option available for small subset of patients repeated failures or unsuitable veins in published guidelines(1) . So far, there have been few reports of saphenofemoral AV fistula (SFAVF) over the last 10-20 years because of previous suggestion of poor patencies and needling difficulties. Here, we describe our early clinical experience with SFAVF. The function and patency rate of accesses appeared to be similar like other mature arteriovenous fistulas in the short-term, although further longitudinal studies are required. We report 2 cases of saphenofemoral arteriovenous fistula in our centre. 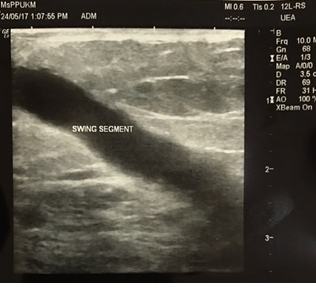 Our first patient was 20 years old lady who known case of ESRF and had failed of right brachiobasilic arteriovenous fistula with complication of right central venous occlusion. With a good size of thigh vein and artery, the venogram of lower limb extremity shown normal variant of vein with no thrombosis, she subsequently subjected for right loop graft of saphenofemoral arteriovenous fistula. Operation uneventful. 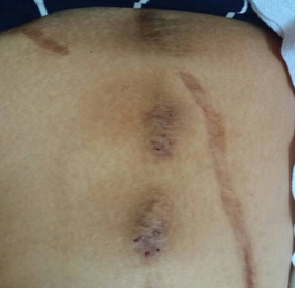 3 weeks later she complained of persistent serous discharged and swelling. The dupplex scan shown there was a collection of infected graft and diameter of long saphenous vein was 6 mm. She subsequently planned for graft explantation together with transposition of LSV for native saphenofemoral AVF creation. Post-operative good thrill palpable and the fistula mature adequately. During follow up the bed side scan shown good flow 1761 ml/min and 45 mm diameter. Figure 1 , Figure 2 . The patient has dialysed through the access for the past 27 months without any problems Figure 3 , Figure 4 . Our second patient was 36 years old gentleman who known case of gout, hypertension and ESRF in the past 11 years. 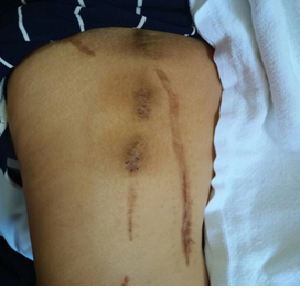 He has been dialysed using right and left brachiocephalic and brachiobasilic fistula previously. Then he dialysed using right central permanent catheter. The CT venogram shown good patency and size of bilateral iliac and femoral vein. 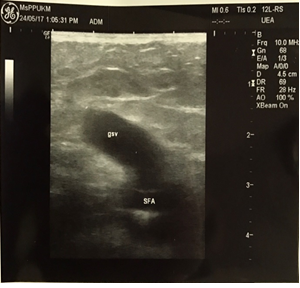 From the duplex scan shown long saphenous vein was in good patency and size. Hence he was subjected for SFAVF creation. Post operatively the LSV was 3 mm diameter and complicated with seroma collection after 1 month of surgery and he has been used the graft for 2 years before he passed away because of severe pneumonia. Hemodialysis remains the most commonly used RRT option around the world. A well-functioning upper extremity arteriovenous fistula (AVF) remains an ideal vascular access because of its superior long–term patency and morbidity/mortality outcomes 1 . Maintaining a functioning upper extremity vascular access for a prolonged duration continues to remain a challenge for dialysis providers 2 , 3 . Patients who have exhausted upper extremity sites because of failed permanent vascular access placement are left with limited options to switch to peritoneal dialysis or explore and use optimal lower extremity vascular access 3 . A lower extremity dialysis vascular access is considered as infamous option for several reasons; limited knowledge/familiarity amongst dialysis providers, inadequate information in nephrology literature, lack of available surgical expertise, fear of complications, and patient preferences 3 . The great saphenous vein for left extremity AVF was first described by May et al in 1969 4 . the retrospective study conducted in 2004 by Pierre-paul et al involved 7 patients, described that mean primary patency was 7 months, primary assisted patency was 15 months, and secondary patency was 16 months 5 . He also conclude that factors recognized to be important for success were an adequate-sized GSV preoperatively, positioning of the GSV loop, and patient body habitus. Like in our situation, the patient selection is very crucial and vital factors to determine the successful rate of this type of AVF, even though nowadays this kind of AVF is not popular among surgeons due to its high rate of secondary intervention and stenosis secondary to neointimal hyperplasia. SFAVF can be considered as a viable alternative assess for patients which left no more options for vascular access in upper limbs. With good technical skills, wide exposure and experience allowing efficient dialysis with good outcome, low morbidity and good patency in long term.